West Lampung regency is mostly crossed by large streams called Sungai Way Besai. The great potential that had by the river is being used for tourism needs, which is rafting. Having holiday at West Lampung, traveler will not have trouble finding a variety of things related to adrenaline rush. In addition to paragliding and mountain climbing, traveler can also enjoy extreme activities such as rafting. River rafting on Way Besai is categorized as grade III with a distance of 3 kilometers. The location is in the district of Sumber Jaya. The river has a length for about 113 kilometers; the 7 kilometers of which have been developed as a rafting track. The starting point to start rafting is taken from Pekon Sidang Jaya and finish in Pekon Sukananti, District Sumber Jaya. The travel time for rafting is about 2.5 to 3 hours. Along the rafting path there are about 13 rapids that must be forded. Although the rapids are classified in the category of grade II and III, but this river remains a challenge for those who like adventure because the rapids are generally the kind of long rapids and it quite heavy and the stepped-stairs. 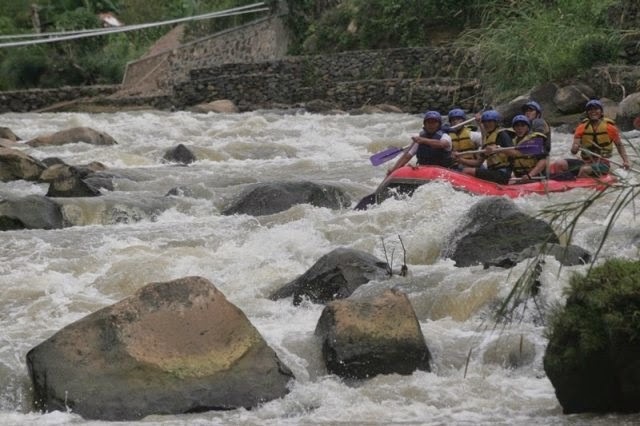 In addition, there are many large rocks in the middle of the river that can make choppy river flows and it requires agility and teamwork so that the boat is not upside down as it passes through the long rapids. Interestingly, the closer to the finish point, the rapids of the river is getting nice and challenging. In addition to the adrenaline test, Way Besai river is also offers beautiful view. You can watch the scenery and variety of flora and fauna from Lampung along the way. Additionally, you can also enjoy the cool waters of the Way Besay that which is fairly clear to swim or to bath.